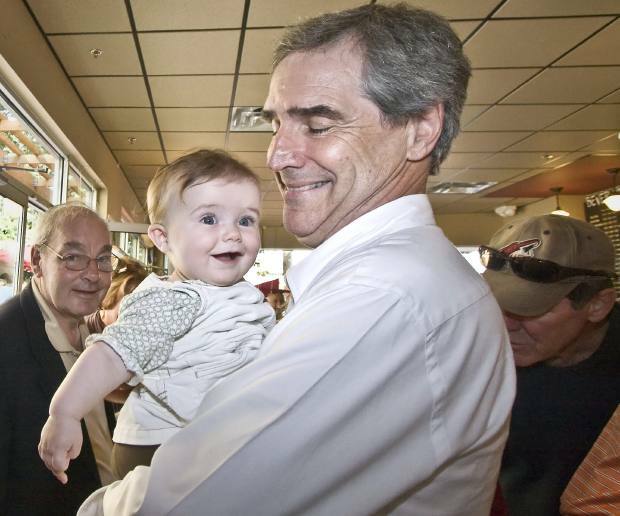 Michael Ignatieff deserves credit for political bravery this week for forcing an election while trailing in the polls. In fact they have trailed in most every snapshot poll since the last election, their best numbers only getting them to within the margin of error a handful of times. By any measure in politics that takes courage but especially in an era of 10-15 second sound bites. It`s short-attention-span theatre out there in voterland. A factor that makes it far more difficult to talk about policy differences and their impacts on everyday life in a meaningful way. Now it turns out that even the right leaning Globe and Mail agrees with me that the Tories should not be using the adjective "unnecessary" and the noun "coalition" when discussing the election. I risk repetition here but today on day two of the campaign Harper gave a speech in Brampton Ontario and according to the Calgary Herald, The word coalition was used more than 20 times during the 10-minute talk, even though Liberal leader Michael Ignatieff on Saturday ruled out forming such a government. And that's a criticism Mr. Ignatieff should level at his opponent. The hypocrisy of Harper having maneuvered towards something quite like a coalition back in 2004 when he was leader of the opposition has been properly picked up and noted by Canada's media because Mr. Duceppe waved it in their faces in a way they could not ignore -- and let me add a hearty thanks for that! That's a direct blow on Harper's integrity in the campaign's opening salvo. That's the kind of thing that could leave a mark or start a trend. 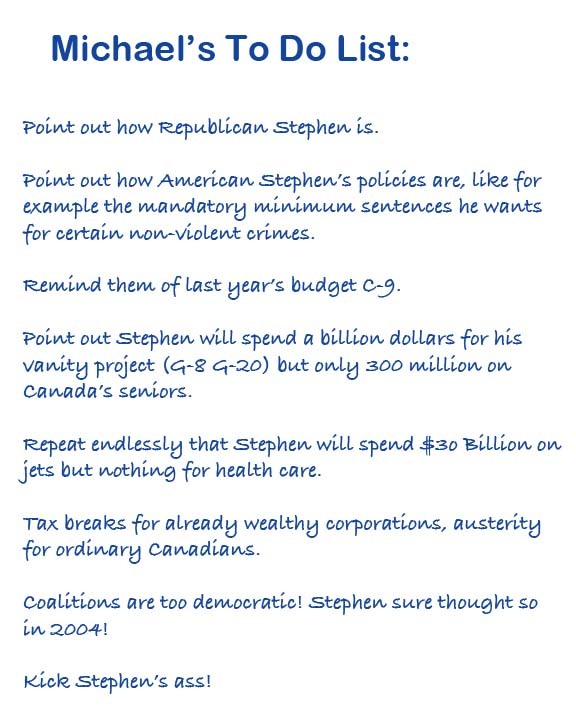 The very fact that Harper wants to start this election season with nothing but personal attacks and attack ads is very like the Republicans and tea party types to the south and the parallels should be drawn. Tory policy and Tory campaigning look and sound more American than they do Canadian. That applies to the tenor of the attacks as well. Do we want our national discourse to descend to those depths? Not likely that the answer to that is yes for most Canadians. There was clearly some strategy in voting non-confidence over the issue of contempt of Parliament as opposed to the recent Conservative budget bill. It's an effective way to call into question the integrity of the Conservative government but that shouldn't stop the Liberal from campaigning against the Conservative budget. 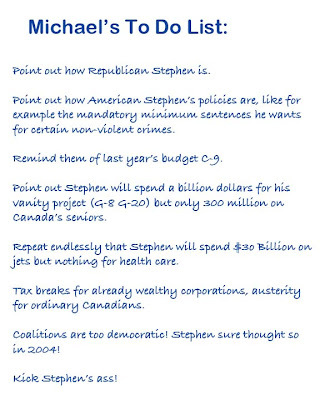 It's just that they should let Canadians know what Harper stuffed into that omnibus budget bill C-9. It that was chock full egregious overreaches like for example allowing the Environment Minister now has the right to unilaterally sign off on drilling, mining and logging projects without study or consultation. And that would be my final suggestion to Mr. Ignatieff. When asked about why another election now, tell them you wanted to do it last year when the Conservatives, even though they were in the minority, were shoving their very right-wing agenda down the throats of Canadians. There was however appreciation for the idea that Canadians were tired of heading back to the polls but another full year passes and still the same contempt for how the majority of Canadians feel about issues and outright contempt Harper's crew has shown for Parliament and valued institutions like Statistics Canada it was high time to bring all these issues to Canadians. I was at the Liberal campaign rally in town tonight at Cirque Tohu. The amphitheatre was packed! Standing room only. Apparantly, 1200 people showed up. Every Quebec candidate showed up on stage while Iggy did his speech. Similar to the one he did in Ottawa to kick off the campaign yesterday. Very well received. Very enthusiastic. By contrast, Steve's opening in Quebec City yesterday only yielded about 250 people and very little enthusiasm. Even Con leaning Bob Fife who's following him through the campaign looked in pain already. Way to show up at the rally! And that's happy news that they're stoked. This is a very ideologically driven bunch of tories I would assert. It would behoove us all to stop them now and undo the more egregious provisions of budget bill C-9. The Liberals have a lot of material to work with here. Let's hope their good start and the abysmal performance of the PM's already tired act (coalitions and stuff could befall Canadians!) gets noticed in early poll numbers. Mo is a good guy to have on your side.